Ultra-crispy roast potatoes with soft, creamy insides, compliment a turkey dinner perfectly. 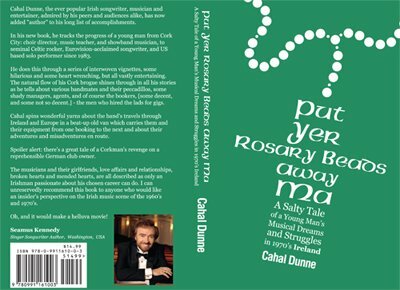 Mashed potato may be the spud of choice in America for Thanksgiving, but turkey always makes my Irish taste buds long for roast potatoes. 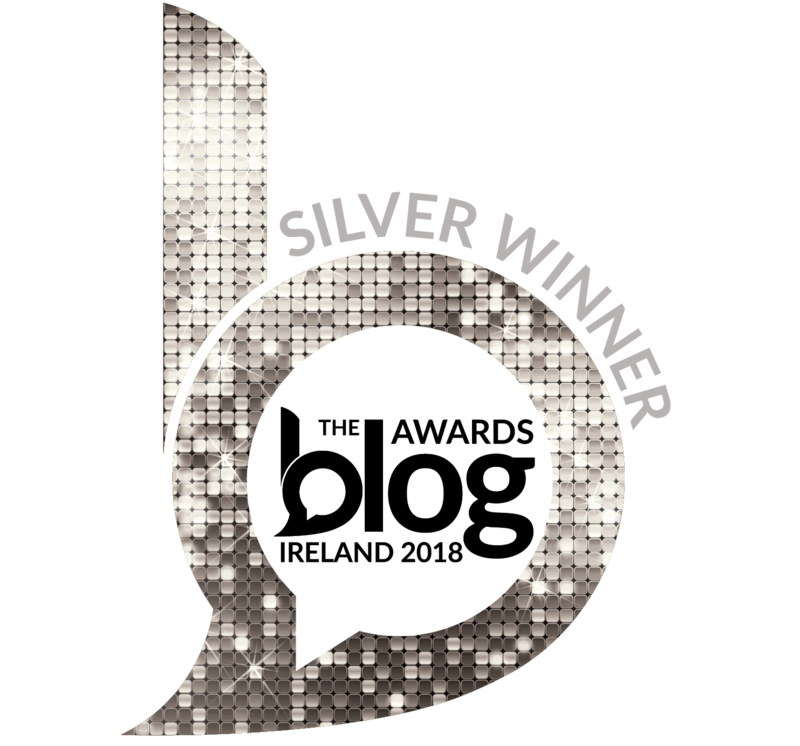 Today’s post is dedicated to the spud and the cooking method of choice for Irish Sunday dinners. 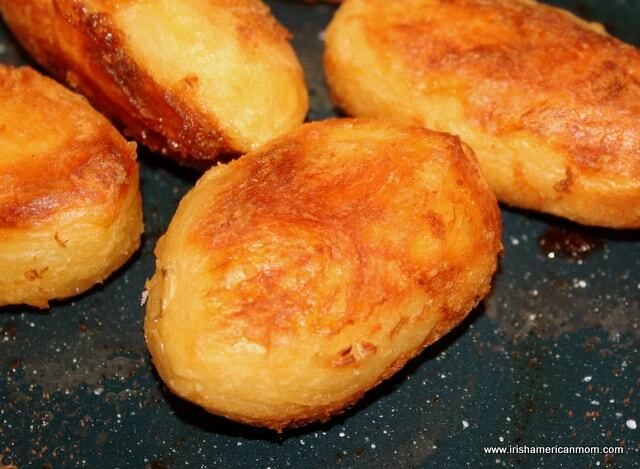 I’ll show you my little tricks of the kitchen trade, to ensure your roasties turn out perfectly crispy every time. And if you prefer a softer outer crust, we’ll discover how to achieve this too. Pre-heat your oven to 400 degrees Fahrenheit. A hot oven is needed to create that golden outer crust. 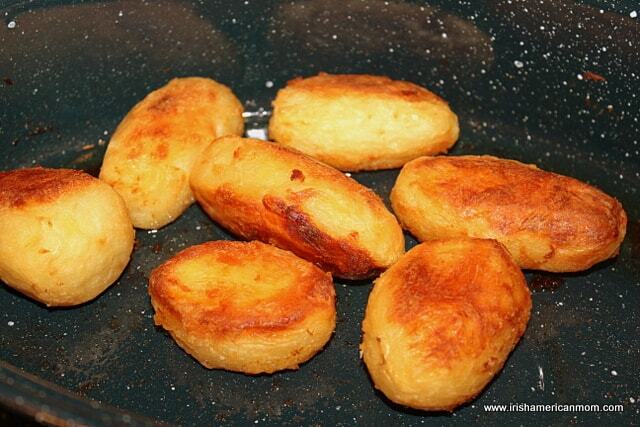 Many people roast potatoes by tossing them into the pan alongside their meat. This way the potatoes will soften and cook, but will never develop a tantalizing, golden appeal. The problem is with the oven temperature. Meat is usually cooked at temperatures between 300 degrees and 350 degrees. Fine for meat, but much too low for crisping. In addition, the steam from the meat cooks the potatoes, so it is impossible to create the dry heat required for lovely roasties. The solution is two ovens, but if like me you only have one, just cook the meat first and then let it sit while the potatoes do their thing. The next big decision is choosing your potatoes. I like russet potatoes, since they cook up a little “flourier” on the inside, and crisp up nicely on the outside. If you prefer a softer roastie then pick a Yukon Gold variety. You can roast potatoes of any size, but I like a medium potato. 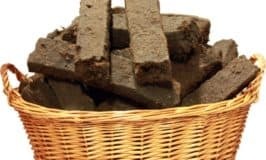 For faster cooking you can halve them, quarter them, or cut them into bite-size pieces. I prefer a substantial potato on my plate. 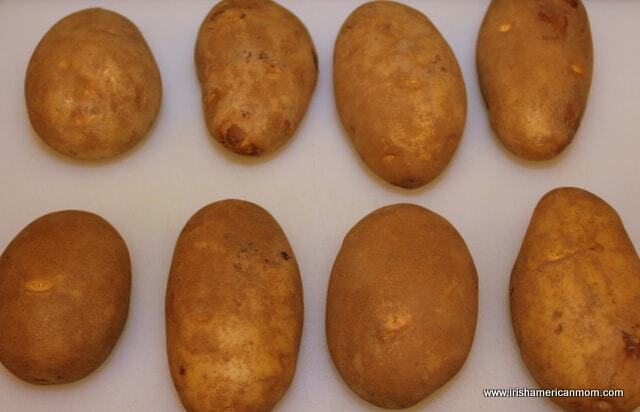 Picking similar size potatoes is very important if you plan on not cutting them. Next peel the potatoes and place them in a large saucepan. Cover them with cold water, season them with salt and bring to a boil. Once boiling, reduce the heat and simmer for 5 minutes. This par-boiling step is key to creating the crispy outer crust. So, even you are tempted, never skip it. While the potatoes are boiling pour about 1/3 of a cup of oil into a roasting pan, then place it in the pre-heated oven. You can use vegetable, canola, or olive oil, or if you have duck or goose fat, even better. This hot oil step will seal the outer potato layer. 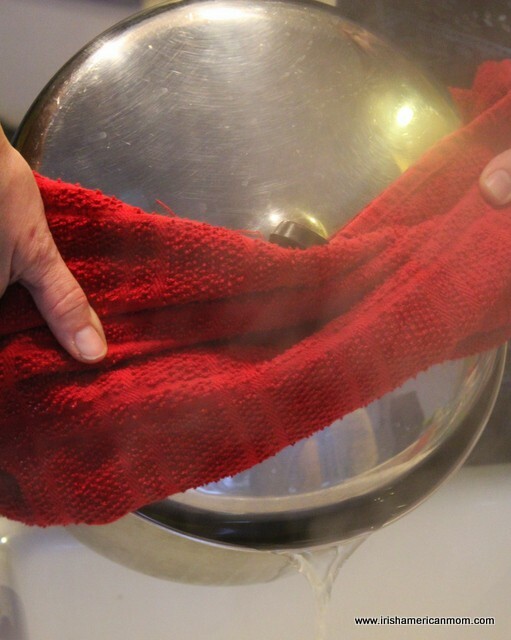 I just take a dish towel, spread it across the pot lid which is pulled away from the lip by a 1/4 inch. Then holding on tightly to the handles I pour the water down the sink. Be sure to keep that lid in place or you will end up with all your spuds in the bottom of the sink. Now comes another little secret for crisping your praties. Put the lid back on the pot and give them a good, old shake. Roughing up the outer surface helps the hot oil stick and do its trick. 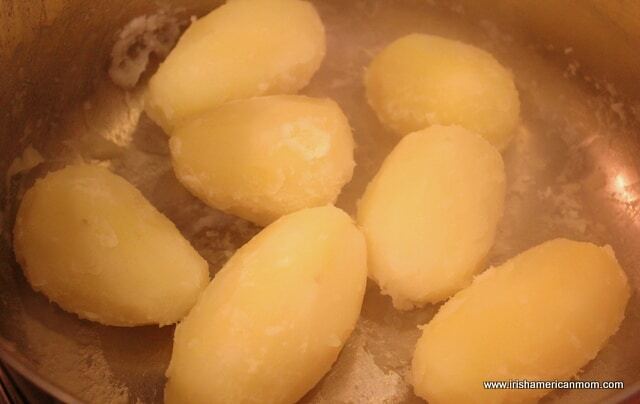 Take the lid off the pot and let the par-boiled potatoes sit for a few minutes to steam dry. 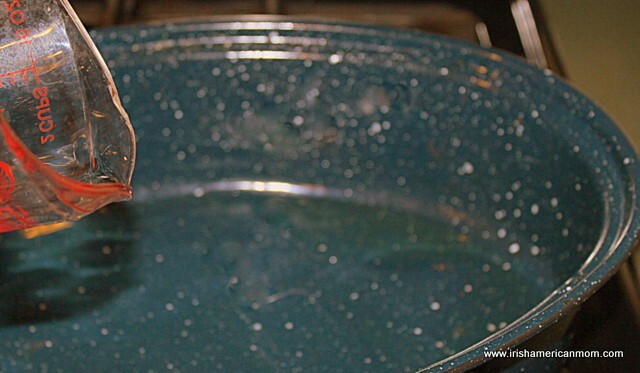 If you strained them in a colander, just toss them around a bit, right in the colander. Next remove the pan of hot oil from the oven and add the potatoes. You should hear a little sizzle. Turn them around in the oil to fully coat all the surface area of the potatoes. I use a fairly big roasting pan. You need to space them apart so they are not touching. If you overcrowd the pan the potatoes will steam cook as their inner juices vaporize in the hot oven. Feel free to season them with salt and pepper at this stage. I don’t bother since I already added some to the water for par-boiling, and I like to keep sodium in our diet as low as possible. Pop them in the oven. After 15 minutes, take them out and give them a turn. Use a metal spoon to pour the hot oil over them. 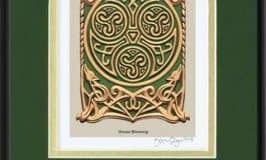 See how they are turning brown in this picture. I turn them again in another 15 minutes. After 45 to 60 minutes you should have delicious, crispy spuds. 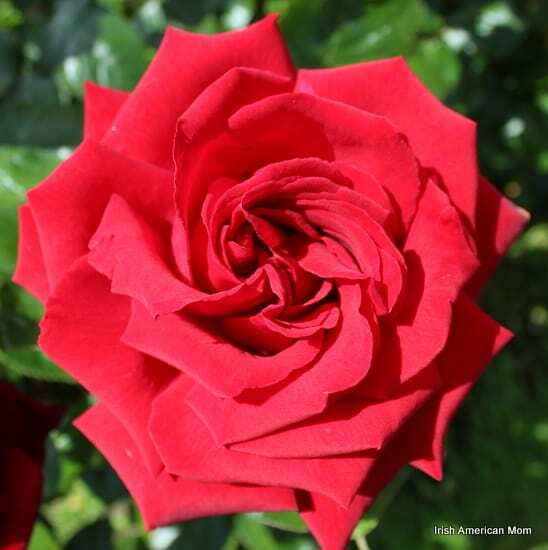 Watch them closely towards the end so they do not burn. I included a 15-minute window for final cooking time. How long is dependent upon the size of your potatoes. 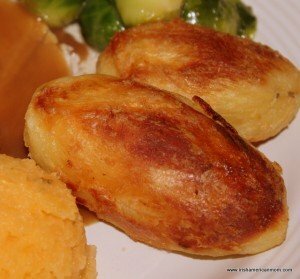 Bite size roasties may cook in less than 30 minutes. And so, there ya go. 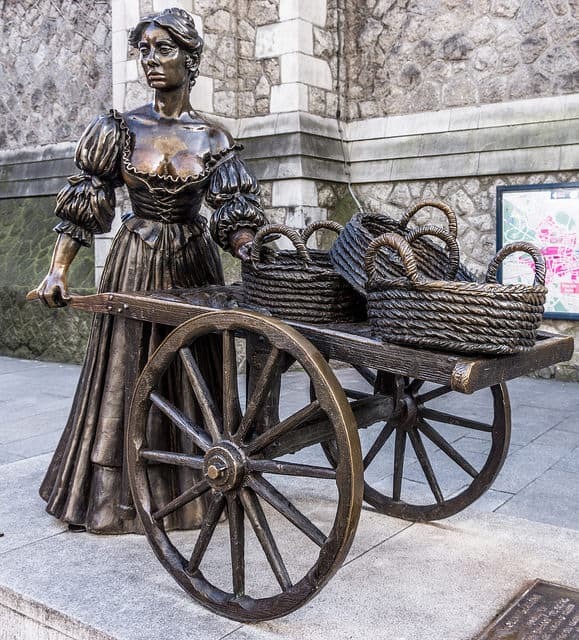 If you follow these steps you will produce perfect, traditional Irish or English roasties every time. My cooking method is for a standard plainroast potato, but the sky is the limit on different seasonings you can add. Garlic, onion powder, paprika, thyme, rosemary all add an extra depth of flavor. Just sprinkle the seasonings of your choice on your potatoes when they are in the roasting pan waiting to hit that hot oven. Happy potato roasting to all! Ultra-crispy roast potatoes with soft, creamy insides, compliment a roast dinner perfectly. Step 1 Peel the potatoes. Leave whole, or cut in half or quarters depending upon the roast potato size desired. Step 2 Preheat oven to 400 degrees Fahrenheit. 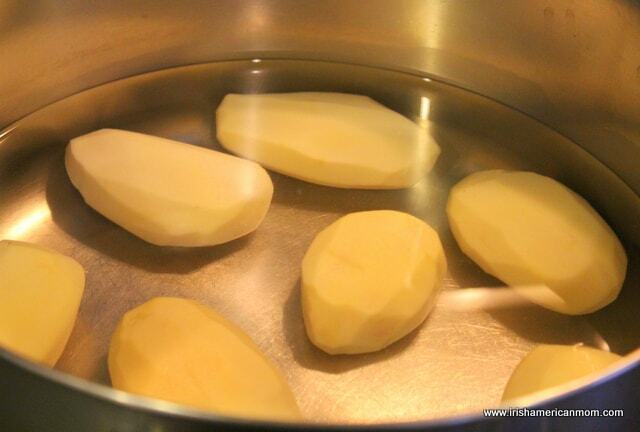 Step 3 Place the potatoes in a large saucepan and cover with water. Add a pinch or two of salt. Bring to a boil, lower the heat, then simmer for five minutes. Step 4 Drain the potatoes. Toss in the saucepan or colander to roughen their outer surfaces. Let sit for a few minutes to steam dry. Step 5 Pour the oil into a large roasting pan and heat in the oven for a few minutes. 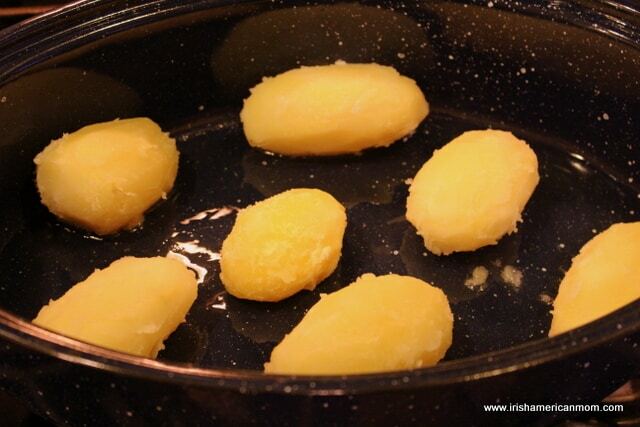 Step 6 Place the potatoes into the hot oil, and turn them gently to evenly coat the surface with oil. Do not place the potatoes too close together. Step 7 Season with salt and pepper as desired. Roast in the oven for 30 to 60 minutes depending upon the size of the potato pieces. Turn the potatoes after 15 and 30 minutes of cooking. 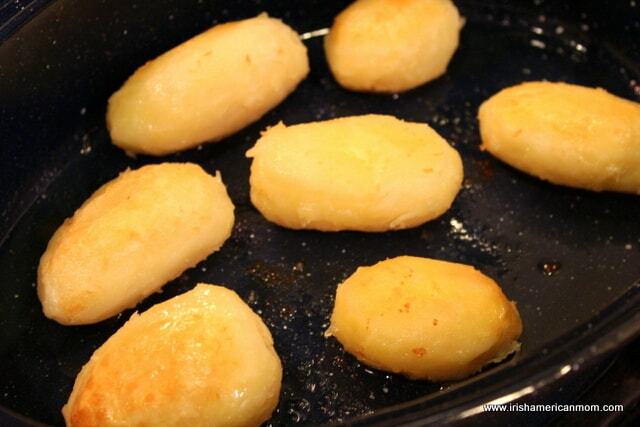 Step 8 Potatoes are cooked when the outer surface has turned golden and crispy. Serve hot with roast poultry or meat.